Coaches, athletic directors, and league administrators understand there’s more pressure than ever on intelligent cost planning and getting the most out of an athletics budget. One of the most significant expenses for school and league athletics is uniforms and equipment. There is a price tag attached to every piece of apparel a team’s players and coaches wear and use. It includes the cost for the apparel item itself as well as the cost of decorating it with names, numbers, and logos. Fortunately, for the cost-conscious team apparel buyer, the bevy of choices available for team sports apparel and uniforms includes plenty of opportunities for savings and therefore maximizing your team apparel budget. There’s strength in numbers. Don’t let your purchasing power leak off campus or out of your league. Bundle your whole school or league into a large buying consortium. Team dealers will usually offer discounts and volume rebates for bulk purchase and the larger the order, the greater the savings. Buying in bulk won’t save your sports organization money unless the apparel styles chosen can be used year after year. As new players are added to your rosters, you will inevitably have to purchase more gear. Choose apparel lines that will last at least three to five years to get the most bang for your team apparel budget buck. A knowledgeable team dealer will know their product lines’ redesign dates so they can guide you. Team sports apparel name brands, like Adidas, Nike, and Under Armour, are appealing to your athletes because of their reputation for excellent performance, aesthetic value, and coolness factor. But top-tier brands come with a premium price. 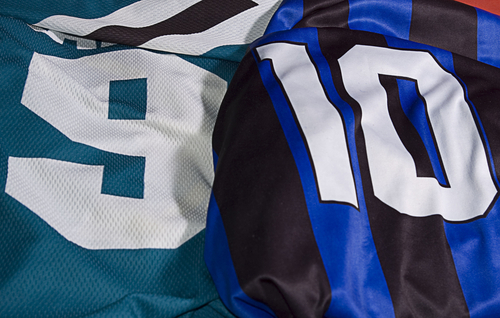 Can you satisfy your players’ desire for name brands sports apparel without busting your team apparel budget? For every piece of name brand apparel, there is a quality alternative from a challenger brand that performs just as well, if not better, for a lower price. Combine name brands with quality challengers in the right situations for savings. If you’re in charge of a school athletics budget, consider this: If one team buys a jacket with a non-standard look, it will only work for that one team. But, if your school has “standard issue” gear, you can buy a jacket that can be used for all three sports seasons. One team out that is simple to standardize across your team’s many teams is the travel suit. When they’re on the road, there’s no reason why your lacrosse team should be decked out differently than your basketball team. Putting these four strategies for saving money on team gear, apparel, and uniforms into practice will save your sports organization money, but it could prove difficult to organize with your program’s coaches, administrators, players, and parents. Our guide, “Cost Reduction Methods: A Guide for Reducing the Cost of Team Sports Gear, Apparel, and Uniforms,” shows you how to implement a plan for savings in your team apparel budget.